Travellers en route to Ravenswood. Many exciting projects are underway and many new transitions have come in to my life. I'll be focusing intently on my comission work and other endeavors (i.e., music, writing & film) for the road that lies ahead so a brief rest will be taken from posting to the Valley of Isk. I plan to begin updates again starting in July or perhaps August, and in the meantime I'll continue to document all of the works in progress as I go. Here are a few pics demonstrating the modular aspect of he Chasm pieces, combined with some massive redwood trees from my Deep Woods project. 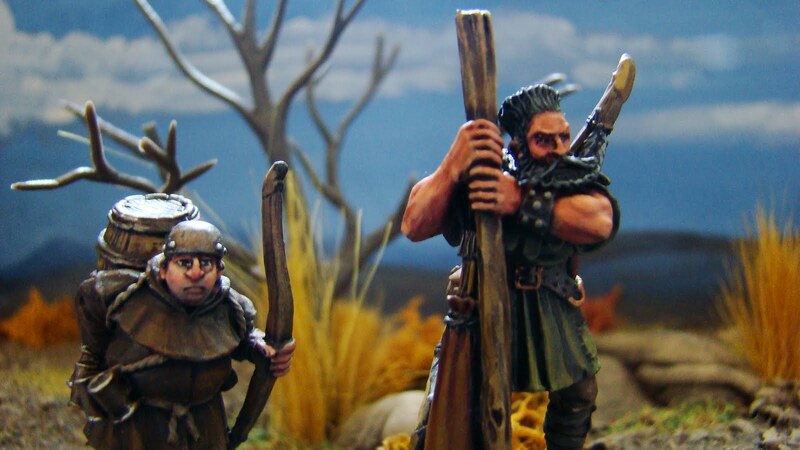 I threw down some Beastmen and Wood Elf models from my collection to give a sense of the scale of the pieces, which are probably some of the largest pieces I have made to date. 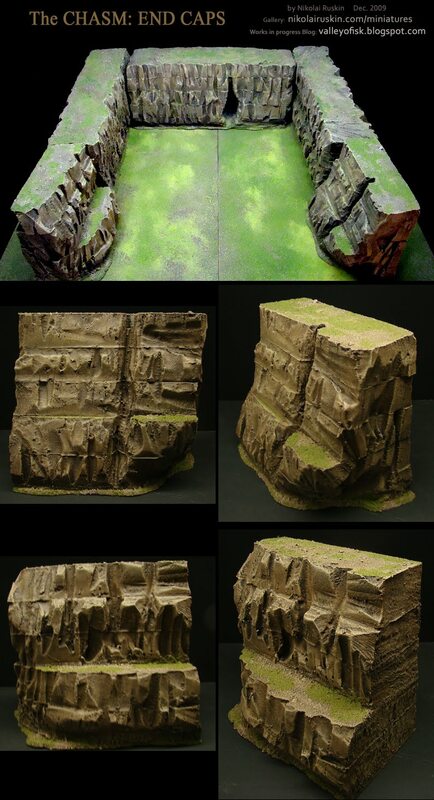 The Chasm set is designed to be group of modular pieces that can form a single cliff face or a deep gorge. These two pieces are the wall sections. The front side of the walls has a beveled base, and the back surface has also been given detail in case the players need it. These pieces would be particularly exciting with a river below and a rope bridge crossing the span... or a giant tree trunk for Kong to toss down. Part one of several blog entries on the CHASM project from November, 2009. Back In November 2009 I made a very large batch of rocky terrain features, including a chasm, some cave pieces and badlands. Due to the cold weather setting in and the large volume of pieces required for these projects, I opted to avoid using my hot wire cutting tools, as the fumes are difficult to exhaust from my basement studio. 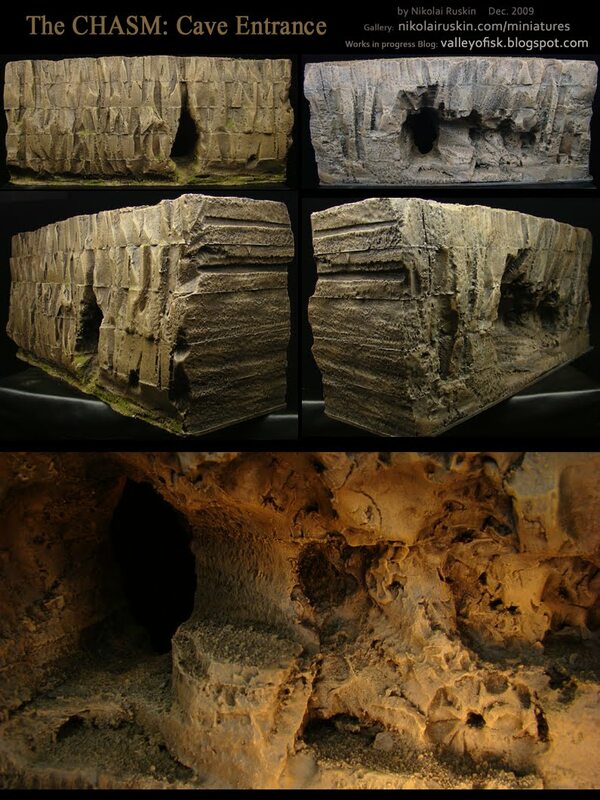 The Cave pieces were developed by reusing scraps of foam from previous projects, which gives them a nice random appearance and allowed me to clear out some scrap from the supply yard. A few observations on gluing EPS foam: I used wood glue to adhere the layers of foam used to make the chasm, with toothpicks to reinforce and hold them together. I had to weigh these pieces down in a large stack with a stump, and even after drying for several days, the wood glue was still damp or wet in places. I have since switched to using two or three hot glue guns for large pieces, which necessitates working quickly. There are other options, such as Liquid Nails, but I have found hot glue to give the best and quickest results so far, and it is less toxic. Another observation about EPS foam is that is not perfectly formed, or perhaps becomes warped during storage and transport. What that results in is the surfaces of two flat sides not being flush when pressed together. In the future I am looking in to finding a good source for larger, thicker blocks of EPS to make the cliffs and chasms with, so that layering will not be necessary. Any excessive gaps were filled with a vinyl spackle. During the sculpting the foam I experimented with some new tools and techniques as a result of opting against the hot wire cutters. 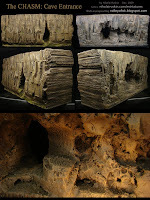 The chasm pieces were textured using a power drill, by running the side of a flat bore bit along the face of the cliff. The bore bits can also work for drilling or digging deep recesses with great results. Other tools used to create contour and shape were a metal sculpting rasp and a wire brush, in addition to the usual box cutters, sheet rock saws and bread knives. PROPANE!! A propane torch was the final element in forming the rock pieces. 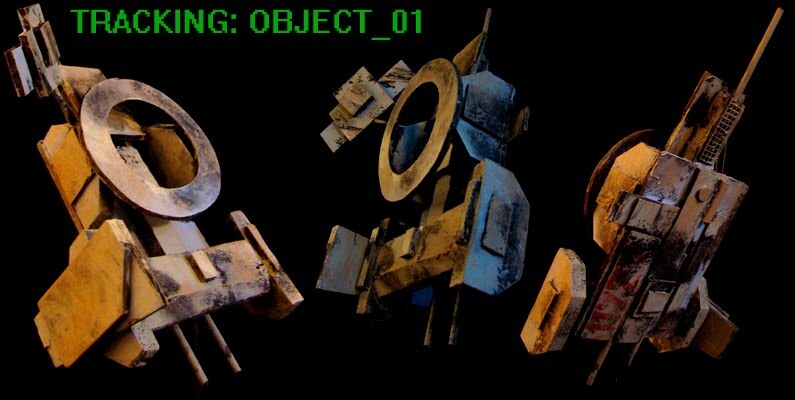 The rough shapes required a bit of smoothing, to add a weathered, eroded look and melt off some of the debris and lighter scraps still clinging to them. I took the pieces outside and very lightly ran a propane torch over the surfaces to slightly melt and shrink the foam a bit. I used EXTREME CAUTION to avoid creating or breathing the vapor and fumes. If you are careful enough, the foam will not be burned, and very little hazardous fumes will be created. I used a filter mask in any case, and the wind was also helping to clear fumes away during this process. I would NEVER advise using the propane torch for this method indoors. The painting process was a big production. I set up some large tables by the grill and base coated everything in a couple of days with Interior matte latex paint. 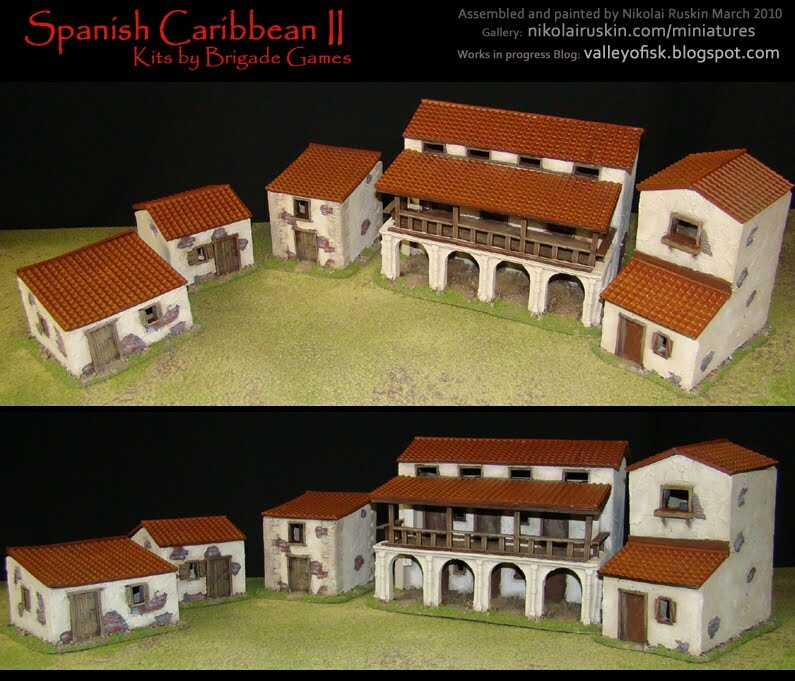 This is durable and very economical, and the best solution for large quantities of terrain features. Space Junk is a set of obstacles for the Flash Gordon Rocket Ship project; a pulp sci-fi space opera extravaganza!!! 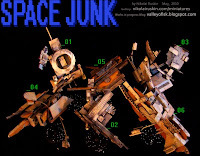 There are six pieces of space junk, cobbled together using the scrap materials from dozens of other projects. I am happy to minimize the amount of waste in my workshop by reusing almost all of the scrap at various times. 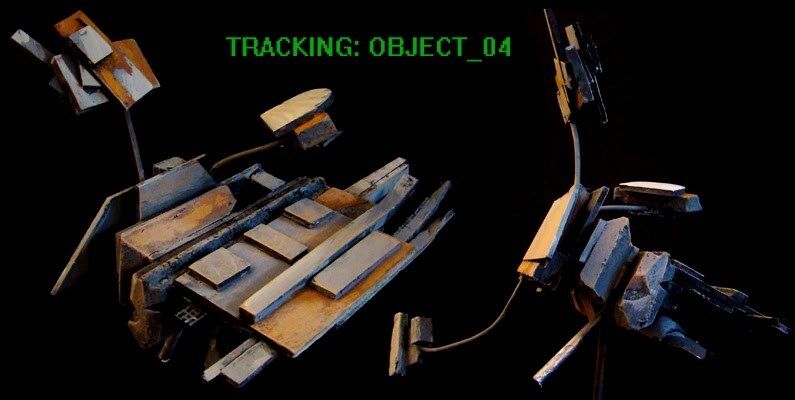 I first mentioned the Space Junk in October 2009, and am finally getting around to posting the pics... better late than never! Between juggling the many projects I am working on, having a laptop crash and misplacing a flash drive, I was set back a bit in processing the photos for the Valley of Isk, but now all is back on track and I hope to be catching up. Probably the first question that will come up is "how big is this stuff?". 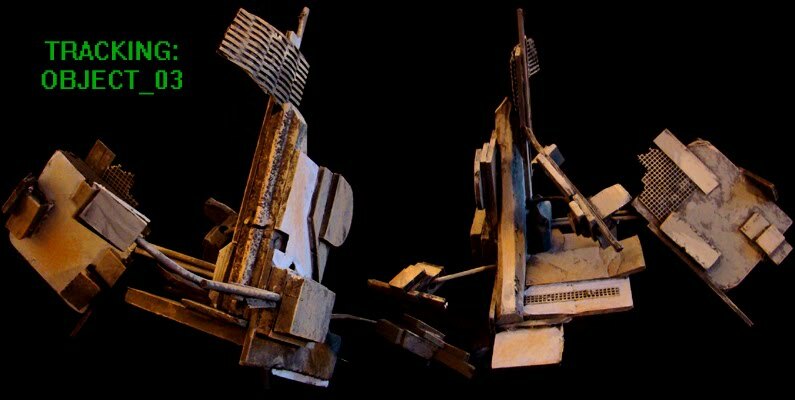 Each piece is approximately 1' tall including the stand, and between 6"-12" wide. Here is a quick preview pic with some rockets and asteroids to give an idea of scale; the rockets are made using plastic Drink cups from Denny's. There are more space pics on the way, of new rockets, asteroids and gas clouds, so stay tuned! 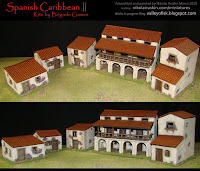 The Hacienda is part of a set of buildings for Spanish Caribbean miniatures gaming and would be great for games such as Gloire and Legends of the High Seas. 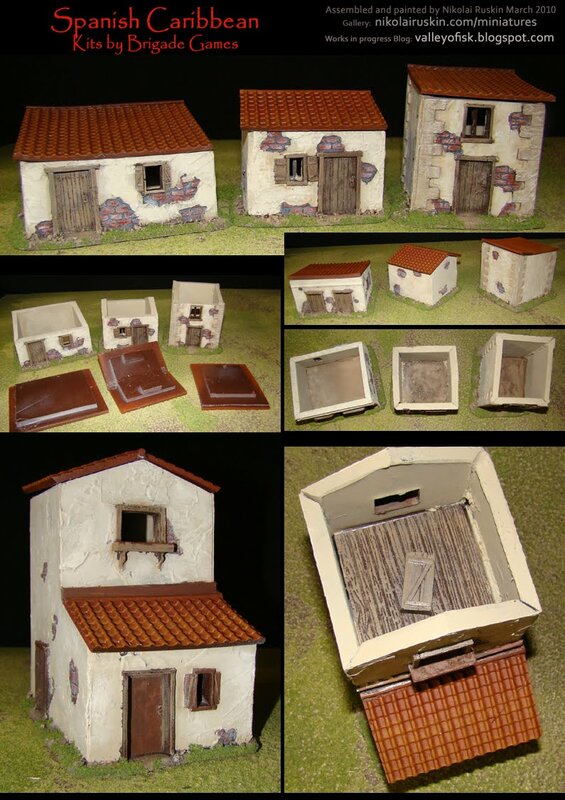 The scale of these are close to 25mm, and would be a bit small along side 28mm scale miniatures, but still passable. The quality of the kits are good, but I would be very very careful around the railings and posts on the Hacienda terrace. 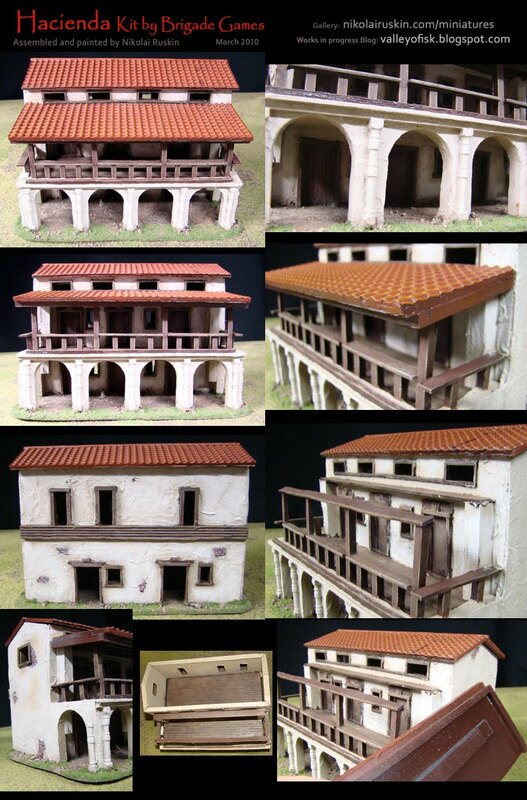 I opted to have the roof tops removable for the second floors and terrace. To do this for the terrace I installed two support posts on the wall (painted white in the photos) and used a strip of balsa on the underside of the roof as a guide rail. The roof tops are a bit thin so I reinforced them with foam core to keep them from breaking during heated battles. The bases are MDF. Glues used are epoxy, hot glue and super glue. I filled any gaps with a vinyl spackle.